Survival knives usually try to do everything with one tool and wind up not being very good at any of it. 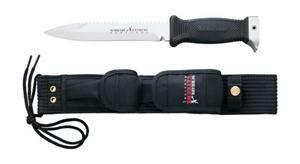 The Schrade Extream Survival Knife is a better knife than most all purpose blades but has a few weak points. The Extream is large (12.5 inches overall length) and heavy (13.6 ounces) with a full seven inches of dagger-shaped cutting edge. That's large enough to handle most camp chores. To Taylor Cutlery's credit, the company didn't equip the Extream with the currently-popular serrated cutting edge that most users will never be able to sharpen. The plain cutting edge maintains easily with only a whetstone and boot leather. On the other hand, the sawtooth blade back -- in combination with the handy wire cutting notch -- makes a leverage break possible at the bolster. Knowing that it isn't a reliable lever ought to help avoid that. The sawtooth edge does work well as a crude saw on both wood and bone, and in a pinch would even hack a short distance through sheet metal. The Extream's textured synthetic handle's molded bolster offers a solid and reliable grip, but beware of the hammer and claw pommel riveted to the base of the tang. Though this may seem like a great extra feature, getting enough leverage to pull a nail with it does require holding onto the cutting edge instead of the handle. Don't do that. As a hammer for driving nails, it's an equally bad idea. One of the smartest things designers of the Schrade Extream Survival Knife did was not to put anything at all in the handy little pockets on the black nylon fabric sheath. You'll be free to add something of real importance, like a magnesium firestarter bar and a honing slip.